I woke this morning at 6:30am feeling quite comfortable and reluctant to leave my bed. Sleep still in my eyes, I stumbled into the bathroom to wash my face and brush my hair. As I was doing so, I noticed movement on the wall from the corner of my eye. It was something small and black, and my first thought was “great, a cockroach”. Luckily for my neighbors, I have never been a screamer. 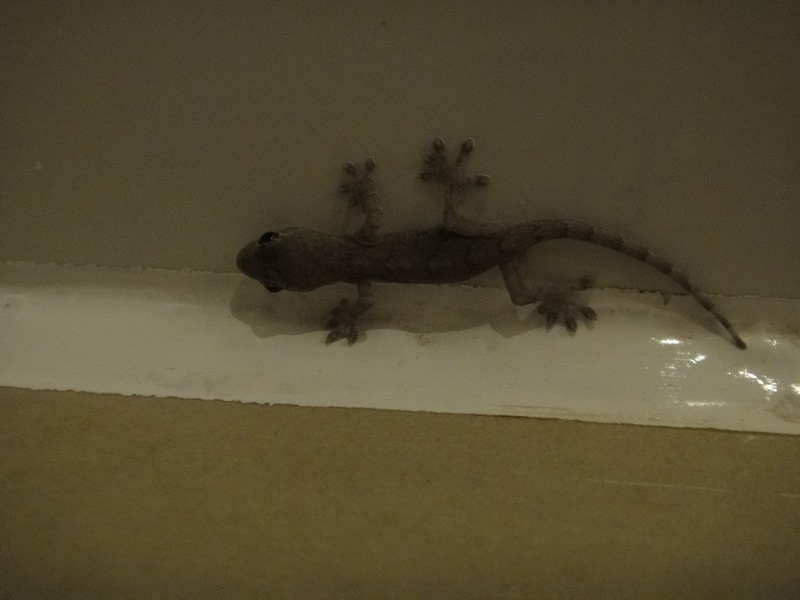 Luckily for me, further inspection revealed that it was a really cute gekko rather than an insect of any kind. 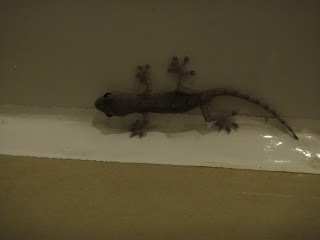 He is probably eating the mosquitoes too, so I was thrilled by the wildlife in my room. Upon my descent from the seventh floor, I found that the continental breakfast was almost exactly the same as the day before. I guess five weeks of the same food is still better than having to make or buy my own breakfast. The most popular item among the Americans is a little number that looks like a rice crispy treat but is supposedly made with egg too. Other offerings are rice porridge with optional sugar, milk or really salty veggie bits, a giant pan of tofu, several kinds of steamed white bread, corn on the cobb, more fried tofu, sometimes squash, hard boiled eggs or tea eggs, white rice, stir fried cabbage and noodles. I would never eat this much processed food in the U.S.. The tea eggs are a favorite of mine though, I think they are made by hardboiling eggs in strong black tea and lots of salt. How the flavor gets through the shell I don’t know, but I love it. We have taken to calling this spread the “white breakfast” since it is fairly devoid of color. Having gotten my bike, I decided to try and bike to clinic with Grant. It did not go well. The route looked clear on the map, but once we got on the road it became abundantly clear that a) not all the roads were on the map, b) the street signs were mostly in characters and not pinyin (the roman alphabet spellings) c) street signs in China are not at each corner but apparently spaced at random and d) no one knew what the heck I was talking about when I tried to ask directions. Grant was the best sort of companion to have on such an adventure, very patient and calm. We finally found our way to the hospital through random alleyways and with the assistance of one kind stranger who spoke English. I did not feel so calm myself by the time we showed up an hour late, but Dr. Qiao was very understanding. She did advise us to take the bus next time and we got the impression that all the Chinese coordinators didn’t really understand why the crazy Americans wanted to bike everywhere. Clinic was horribly hot again, making it hard to cool off after our crazy adventure. I would have done anything for some cold water, but Dr. Qiao’s assistant gave us hot tea instead. This is what everyone drinks in China, no matter how hot it is outside. Partly this is because all drinking water must be boiled first and partly it is because it is better for your “Spleen Qi” or digestive function. Clinic was just as interesting as the day before. We saw some of the same patients and some new. In the U.S. it is most common for a patient to get acupuncture once or twice a week at most, but in China patients expect to come in daily. This is great, because in the past I had often noticed that patients reported feeling better for a few days after a treatment but then their complaint worsened again before their next session. The effect of acupuncture is cumulative, so daily treatments are really ideal for many situations we saw like facial paralysis and severe or acute injuries and colds. Seeing patients two days in a row also helped us track our effectiveness, as there was no time for patients to forget any change in pain or functionality after the treatment. 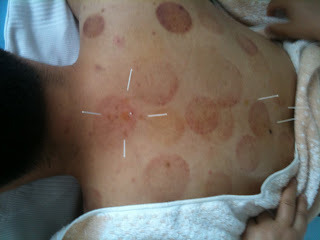 I saw a few techniques that were not employed much at OCOM, such as Yang Ci, (five needles surrounding technique) around DU14 for severe back and neck pain. Cupping over needles was another skill that we had been told about but not shown at OCOM. The patients did not seem uncomfortable at all with either technique, and they appear to be quite effective. 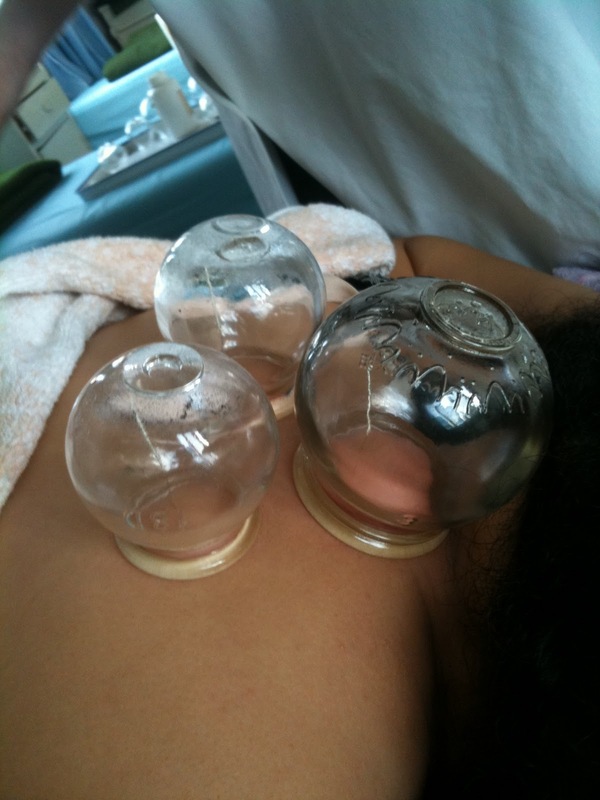 Cupping looks strange, but has been used in China (and many other countries) since at least 1,000 BC. The way it works is that a burning cotton ball is inserted and quickly removed from a glass cup. The cup is then quickly placed on an area of bare skin to create a suction seal. The cup is not hot or painful, but makes the skin feel kind of tight. After the cup is left there for a half hour or less there are red dots that appear on the surface of the skin. This is the congested blood in the area and the Chinese call it “sha”. The marks look a bit like bruising in photos, but are much more superficial and not painful. Once the sha, or stagnation, is sucked up from the deeper levels the body is better able to get rid of it as well as any heat or toxins that may have been stuck in the area. The really interesting part is that the more stagnation an individual has, the darker the area under the cup will become. In Chinese medicine a famous principle is “with stagnation there is pain, with no stagnation there is no pain”. Thus cupping is appropriate for a lot of complaints, but I have never seen so many cups used at one time before. Dr. Qiao also uses cupping on the abdomen for weight loss and for cough and phlegm in the lungs. 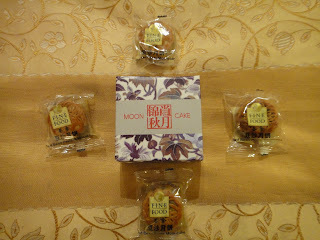 After the morning shift Dr. Qiao gave us moon cakes, as tomorrow is the autumn moon festival, a national holiday. These are beautiful cakes with various fillings like red bean or green tea. Most of them are sweet. On the way out of the hospital we saw various other doctors giving each other moon cakes as well. One doctor was actually chasing another, trying to give him a moon cake while the second doctor tried to dodge around people and escape down the elevator. It was a cute chase scene. For the autumn moon festival most people take three days off and go home to eat a big meal with their family “like Thanksgiving” according to Dr. Wang. It is also a fairly romantic holiday, as people sit and watch the moon in the evening. The moon is supposed to be nearest and brightest on this day. 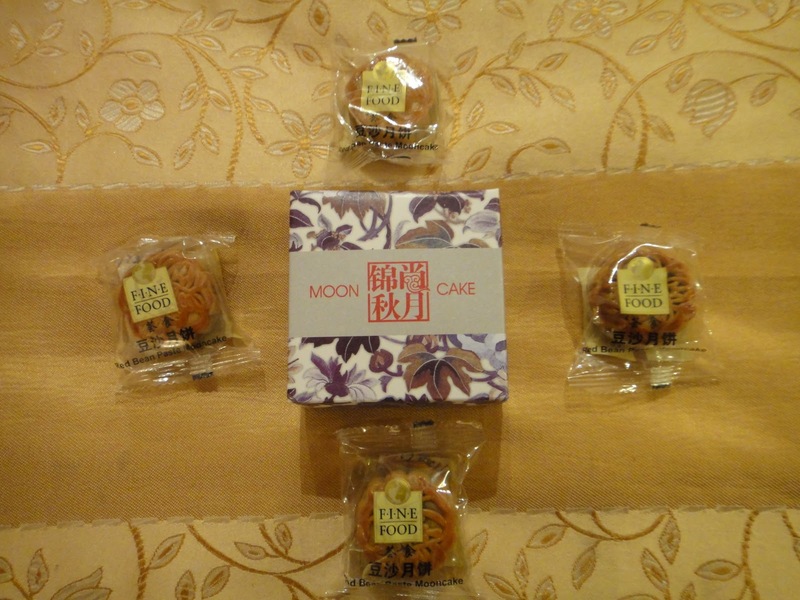 We received more moon cakes from Nanjing University of Traditional Chinese Medicine, our hosts, at our welcome ceremony after lunch. There were speeches and a group photo shot. 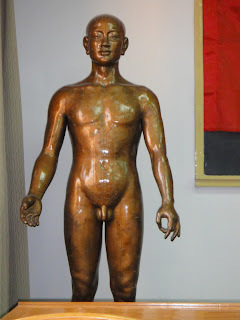 The room where they speeches were conducted had a life size bronze “acupuncture man”, a replica of a famous statue created by Wang Weiyi (c. 987-1067). This statue was used for Imperial acupuncture exams in ancient China and had holes for 657 acupuncture points. The statue could be coated in thick wax and filled with water. When an acupuncture student inserted a needle in the statue, water would drip out if the point had been located correctly. 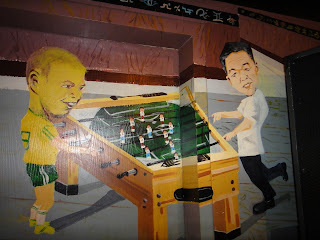 In a way, I envied those acupuncturists of the past, as my point location exams were conduced using live partners and no two people are shaped exactly the same. After the ceremony, they fed us as the big swanky Sheraton hotel buffet. The OCOM group then adjourned to the Nail Bar, a “jazz club”. Not hardly, at least by Portland standards. 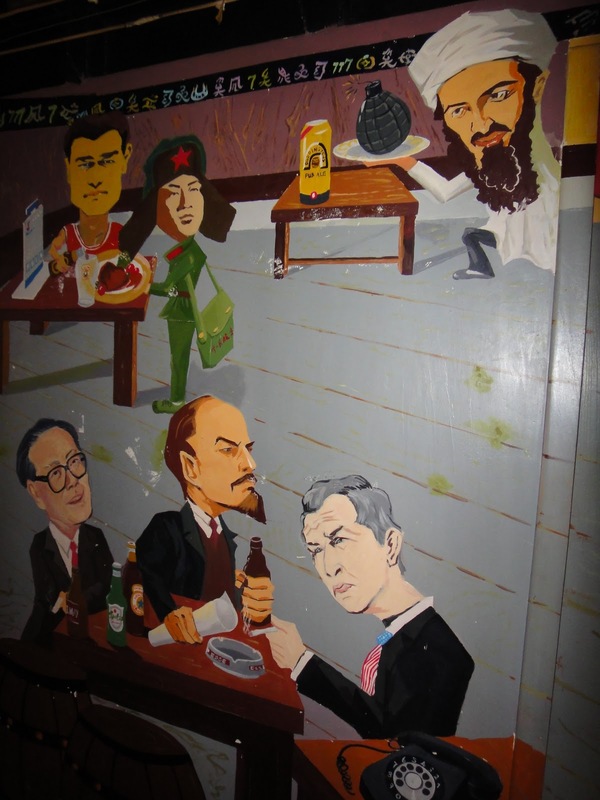 But the drinks were drinkable and the murals on the wall were hilarious. 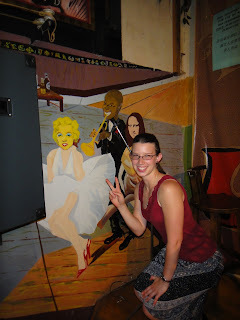 In one, Louie Armstrong appeared to be biting his trumpet for some reason. Others featured world leaders playing foosball and drinking beer. It was a full day.